With US equities continuing to slide, the VIX climbed in early morning, but was knocked lower into the close, settling -1.3% @ 15.09 (intra high 16.66). Near term outlook offers continued downside to the 200dma - in the sp'2013/15 zone.. which should equate to VIX in the low 20s. 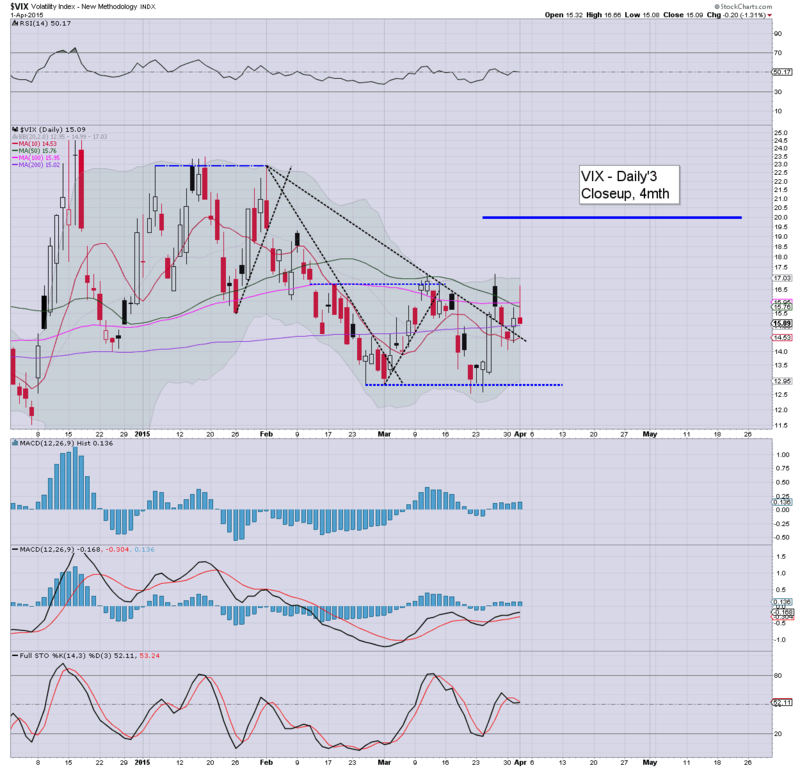 VIX made an initial attempt to break the double top of 17.19, but fell somewhat short. As for the weak close... difficult to say, it could merely be one of the usual 'quirks' seen in VIX land, although is normally seen on a late Friday afternoon. *Equity bears should be seeking a break <sp'2039.. which should see the VIX break 17.19... and from there... sp'2010s.. with VIX in the 20/22 zone. US equities closed pretty weak, sp -8pts @ 2059 (intra low 2048). The two leaders - Trans/R2K, settled lower by -0.8% and -0.1% respectively. Near term outlook offers a test of the 2039 low... which looks set to fail.. and opening the door to a more critical test of the 200dma in the sp'2013/15 zone next week. A second day for the equity bears.. and the 'Monday nonsense' has been fully negated. Frankly.. its looking rather good for a test of the 200dma next week. Things really only get interesting on a break of that though. If so.. then target will be the 1960/40 zone. US equities look set for a second consecutive net daily decline. Equity bears should be content with any close <sp'2060. The key low of sp'2039 looks set to be challenged.. and broken... opening a more critical test of the 200dma in the 2013/15 zone next week. Price structure is arguably a bear flag on the hourly equity chart.. with a corresponding bull flag on the VIX chart. All things considered, bears did some damage today... a net daily declines looks a given... and it sets up tomorrow pretty well. 3.33pm.. the Rats are selling.... lots of trades flying through on my screen.... bears look set a second day in their favour. 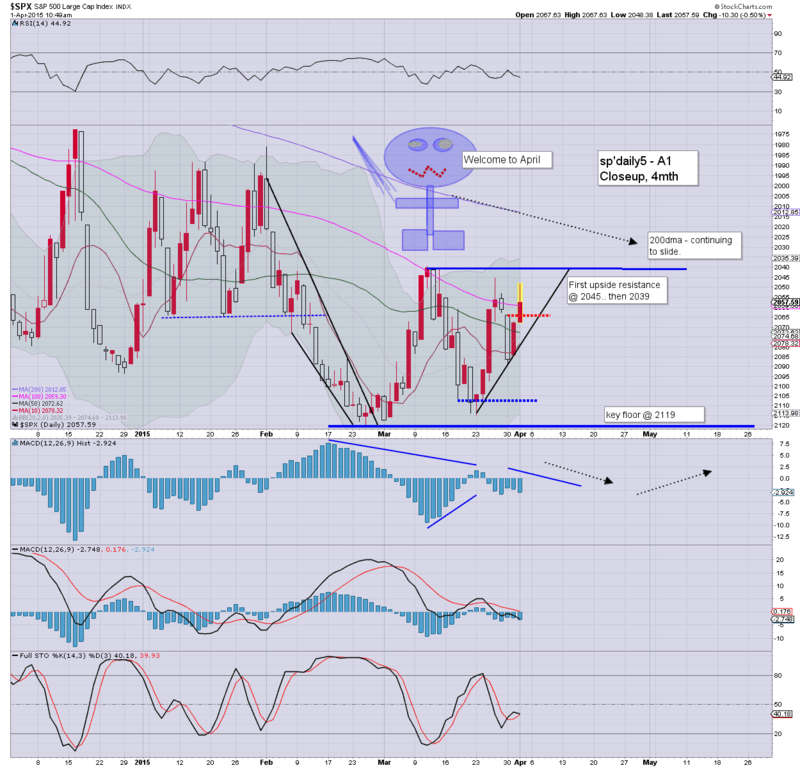 VIX 16s would be useful to confirm. US equities are seeing another vain attempt to bounce into the typical turn time of 2.30pm. A net daily decline still seems highly probable... along with VIX in the 16s. Gold is holding sig' gains of +$20. Oil +4.7% in the $49s. 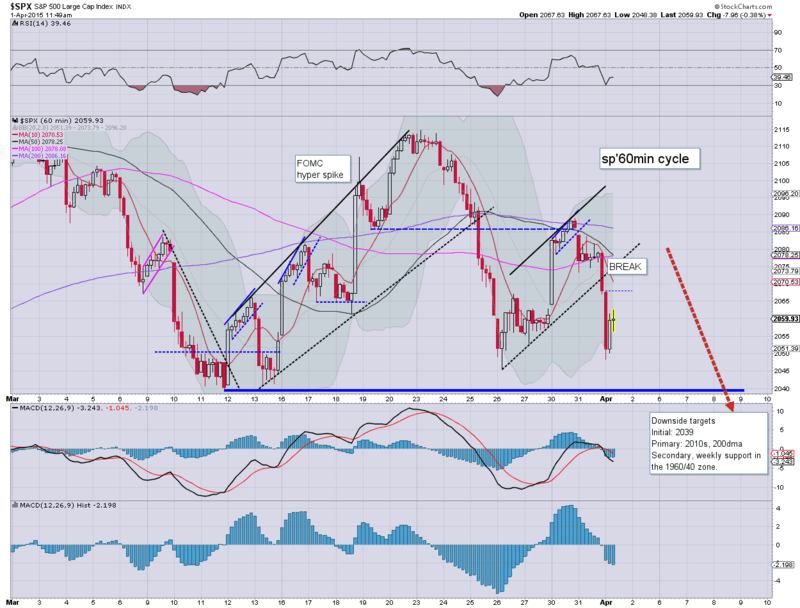 Typically, market will max out on a bounce around 2.30pm.. and then rollover into the close. Notable weakness: F, -1.3%... with most transports stocks having real issues today. Price structure on the smaller 15min cycle was a bear flag... looks like we're already on the way down. US equities remain broadly weak, with the sp' in the mid 2050s. VIX is holding moderate gains of 4%.. in the upper 15s. Metals continue to build very significant gains, Gold +$22. Oil is in hyper-ramp mode.. +5.2%, back above the $50 threshold. 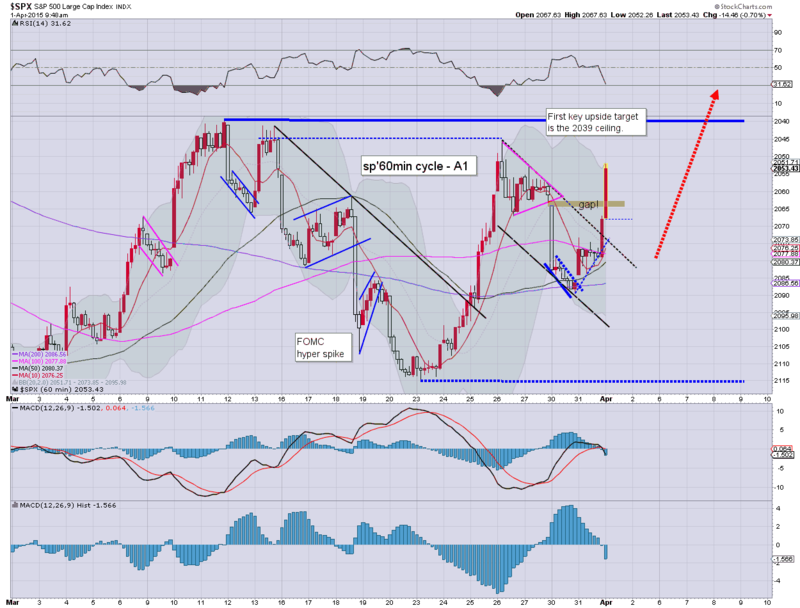 *note the weekly cycle, back to an outright bearish red candle.. with a marginal break of rising trend - from the Oct' low. Regardless of the exact close, the Monday gains have been fully reversed.. and we're headed for a test of the 2039 low. 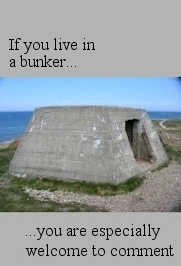 I do not expect it to hold. 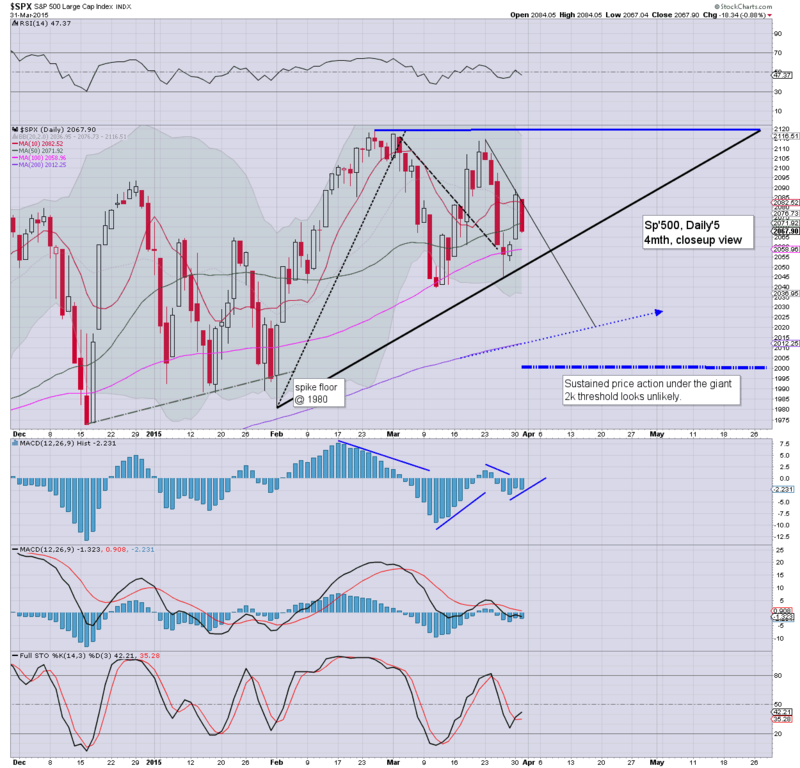 US equities remain moderately weak, with the sp'500 hovering around the 2060 level. VIX is holding minor gains of 3% in the upper 15s. Renewed weakness looks viable into the close.. with the first real opportunity of taking out the 2039 low... by late Thursday. 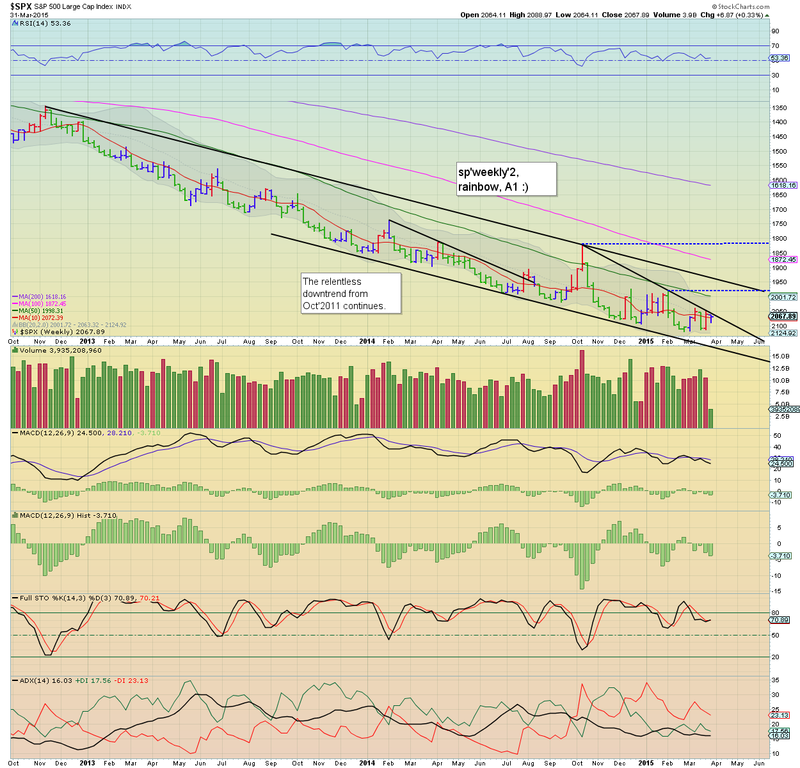 Metals and Oil are both building sig' gains. *the inverse charts from earlier.. kinda kooky, huh? So.. we've broken to 2048... and a bounce to 2062. First resistance is the rapidly declining hourly 10MA... which by the close will be around 2060. Equity bears should be content with any daily close in the 2050s. A little bounce into the afternoon would be very natural, but it will do nothing to negate yesterday afternoons break of rising trend (sp'2072). The damage has been done, market looks set to test the 2039 low.. and take it out. Monthly MACD downside pressure has ticked lower, and is now in the -5s... the lowest level since late 2011. Momentum is increasingly swinging to the equity bears. 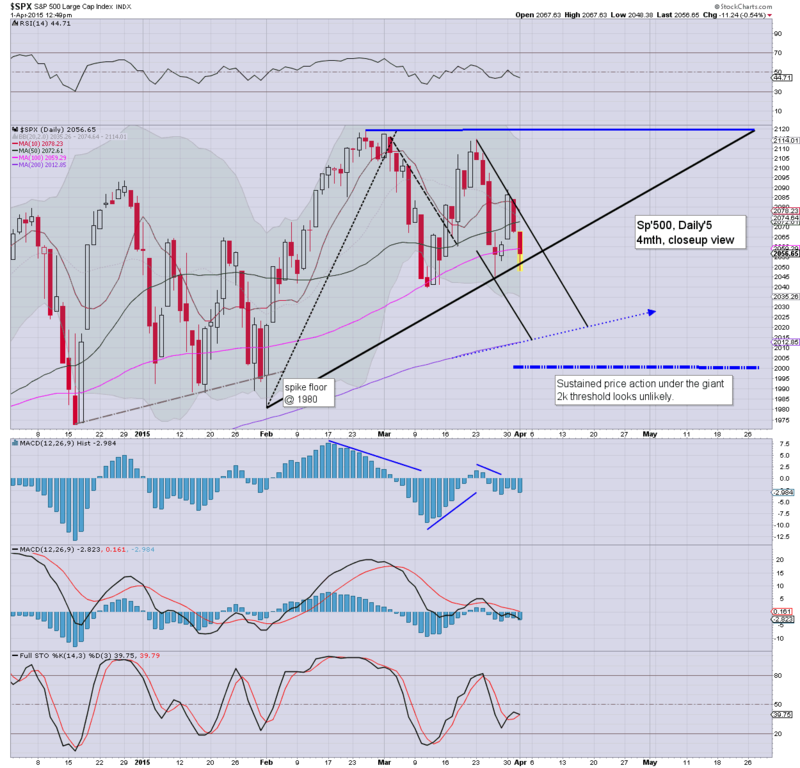 Despite the strong overnight recovery, equities open weak, and the bears have already broken into the low sp'2050s. VIX is yet to show any real concern though... key threshold to break is 17.19. 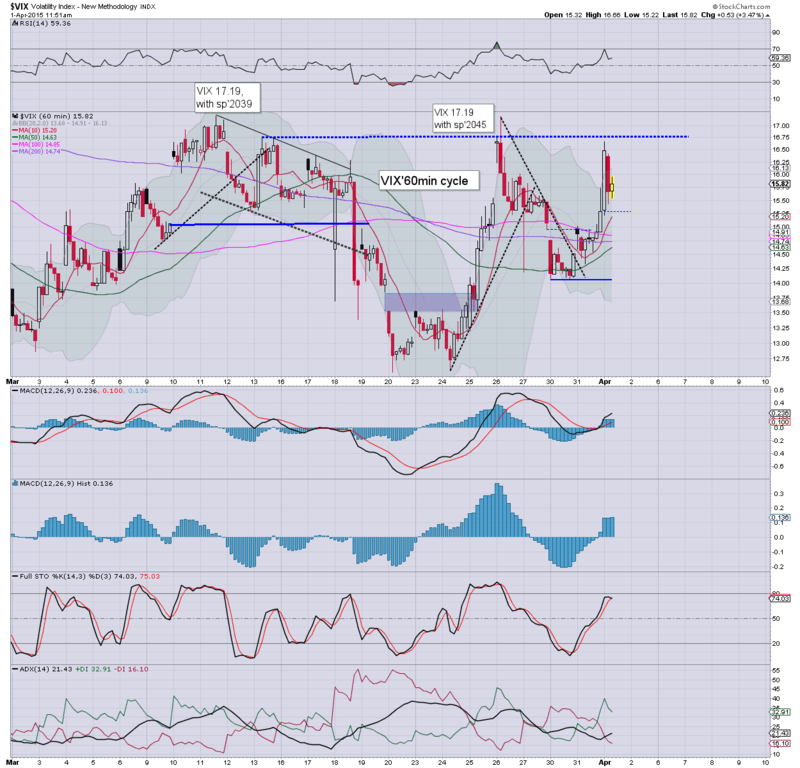 Metals are holding gains, Gold +$12. Oil is +0.8%.. ahead of the latest EIA report. 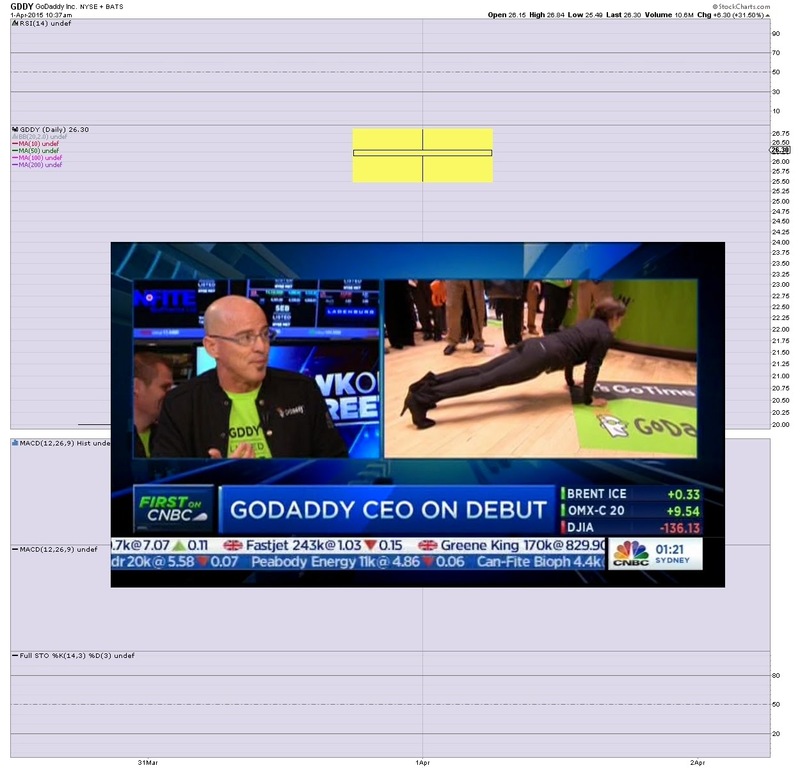 *Godaddy (GDDY) set to be listed.. and somewhat understandably... clown finance TV is trying to talk that one up. So... a reasonable start to the quarter... and after yesterday afternoons key break of trend... it would to be a case of just how low we close today. Things really only get interesting though when VIX >17.19... at which point it'd likely snap straight into the low 20s. Unquestionably...the rats are getting twitchy. A break to sp'2038... and below.. and the rats will all jump at once! 10.30am.. chop in the sp'2050s... but clearly... this is still very reasonable follow through from yesterdays break. ..EIA oil report... weekly surplus... 4.8 million barrels... certainly less than the recent average. Good morning. Futures have largely recovered from overnight lows (sp -27pts), but are still a little weak, sp -6pts, we're set to open at 2061. Metals are seeing minor gains to begin Q2, Gold +$1. Oil, +0.1%, ahead of the latest EIA report. 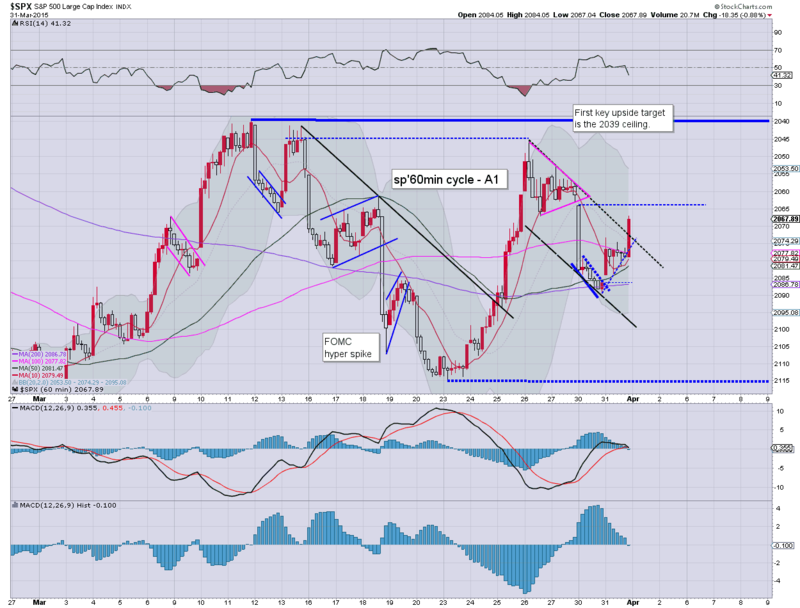 *I wanted to highlight the bigger weekly cycle, as a reminder of the broader trend. 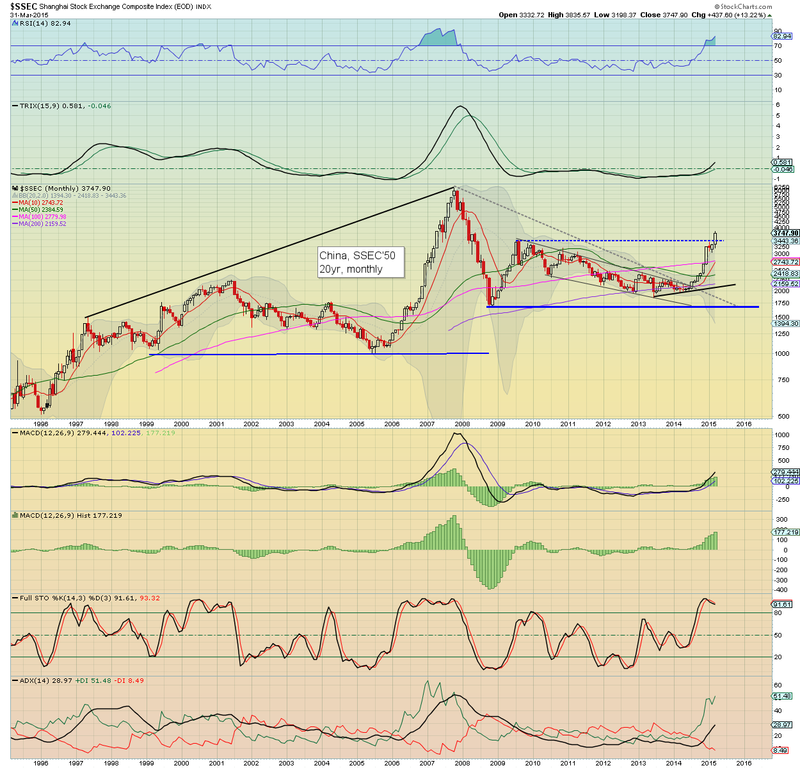 Even a move to the sp'1960/40 zone would not negate the broader downward trend. The equity bull maniacs have a full 5% of buffer zone before any sig' technical damage is done. ADP jobs: 189k net gains.. but that is a clear miss.. market was expecting 230k. So.... Tuesday afternoon saw a key break... and we're set to see some follow through. Equity bears could do with a daily close <2050.. whether today.. or tomorrow.... along with VIX in the 16/17s. 9.26am.. Hmm... set to open -2pts... 2065... for those watching last night... clearly, this is a pretty lame open. In any case.. yesterday did see a key break.. so.. lets see how we close. 9.37am.. Bears making some early progress... minor gap filled.. and 2050s due. It was an interesting end to March/Q1, with the sp -18pts @ 2067... with a rather clear break of the short term rising trend from the recent low of sp'2045. 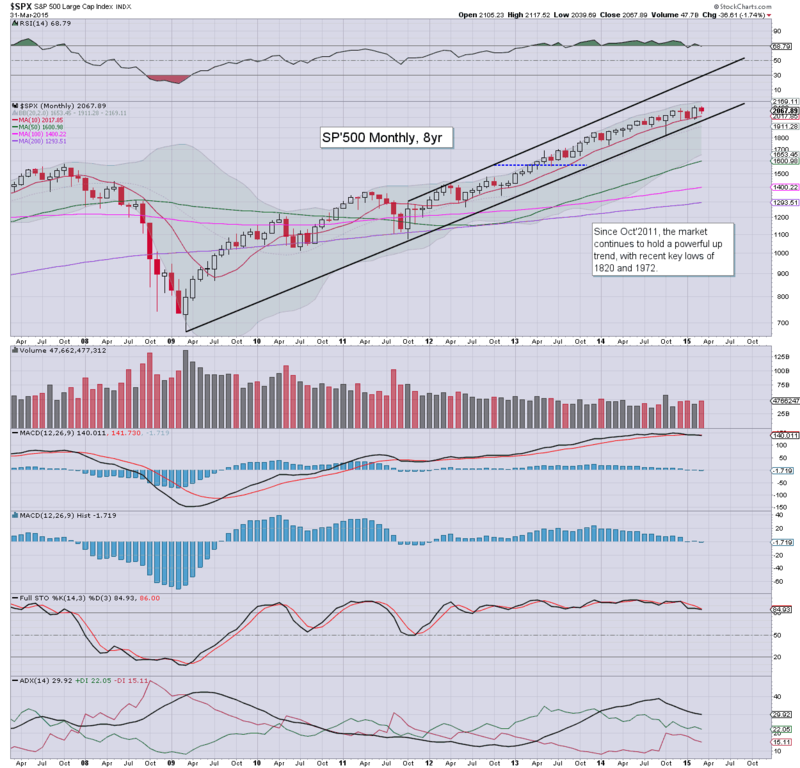 The door has re-opened for a test of the 200dma in the sp'2010s... but that is clearly out of range until next week. So... Q1 comes to a close, with a net monthly decline of sp -36pts (-1.7%). Certainly, nothing particularly significant, and in no way does it negate the hyper-gains of February. Primary trend remains bullish.. but with a bearish MACD cross... the underlying momentum now moderately favours the equity bears. As I have been highlighting since last summer, a monthly close in the 3500s would be exceptionally bullish for the longer term. The Shanghai market achieved a powerful net monthly gain of 13.2%, with a decisive close in the 3700s. Suffice to say.. 5k looks an easy target... and given another two years... the Oct'2007 high of 6124 looks set to be surpassed by a very large amount.. even the giant 10k threshold looks viable by mid/late 2017. 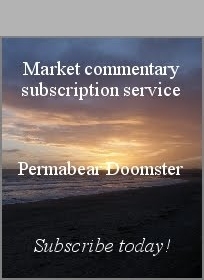 *I will cover the world market indexes in depth this weekend. Q2/April will begin with ADP jobs, vehicle sales, PMI/ISM manu' sector, construction, and the EIA oil report. 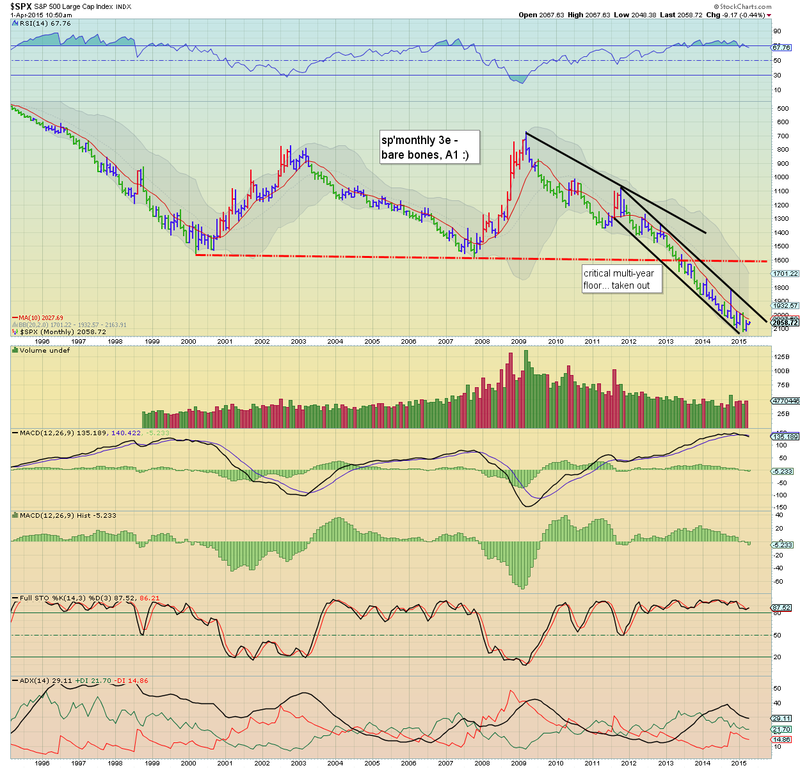 Indeed, perhaps the most interesting aspect of Wednesday will be the latest oil inventory. Another surplus somewhere in the 7-10 million barrel range seems highly likely. At some point Oil storage will be maxed out... and then its 'fire sale' time. As of 10.32pm EST... futures are equiv' of sp -15pts... which would give an open of 2052. 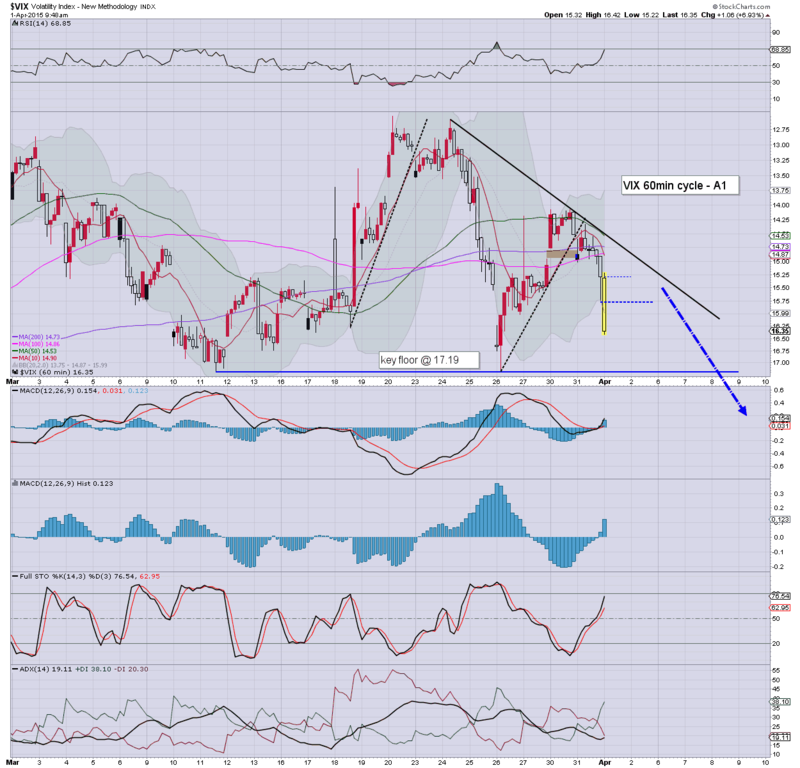 Interestingly, there was an earlier low of -27pts.. which is an initial test of the recent low of 2039. Clearly... this afternoon's break of trend was rather significant, and has opened the door to much lower levels. 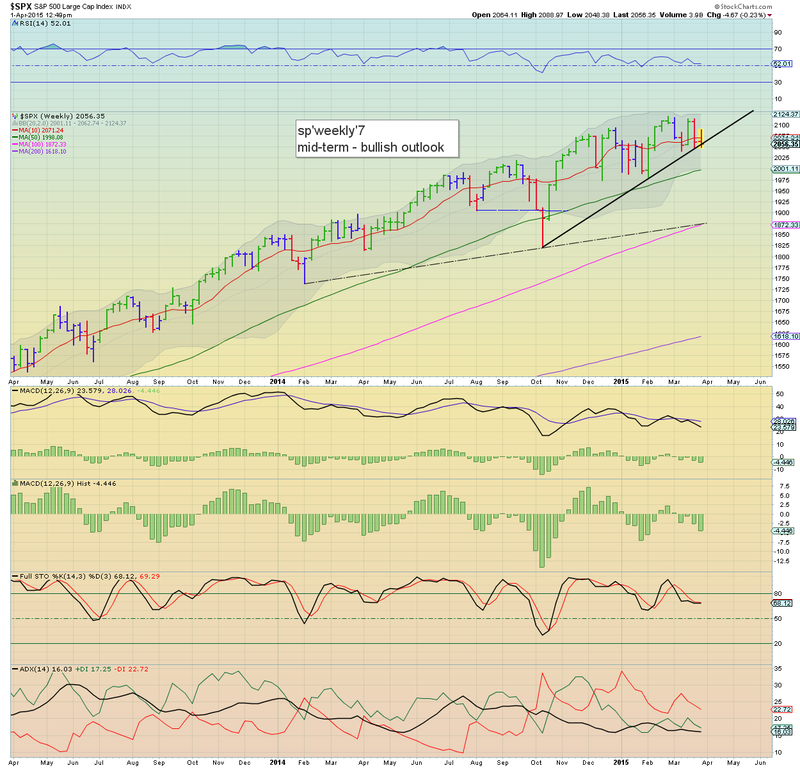 Frankly, I'd now be surprised if we don't at least test the 200dma, which next week will be around sp'2014/16. 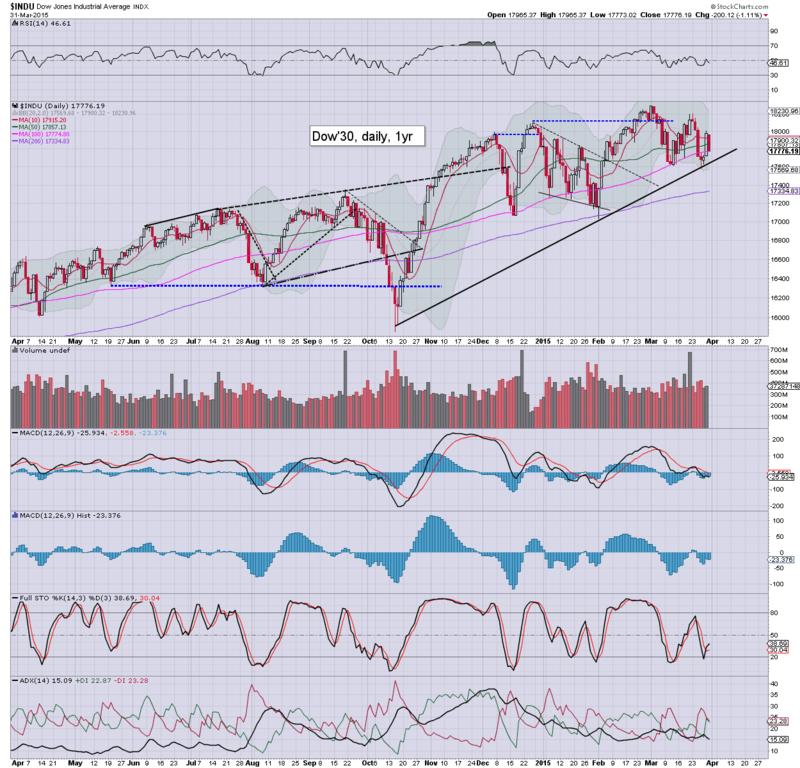 ANY break of the 200dma will open up a brief free fall move to lower weekly support... in the 1960/40 zone. In any case... Wednesday looks set for significant downside follow through, and it will make for a rather entertaining start to Q2. A pretty interesting end to the day, month.. and indeed, Q1. Today's net daily declines were borderline significant for the sp/Dow, and with a break of the short term rising trend (from sp'2045).. the door is open to a test of the 200dma in the sp'2010s.